Located in the northern end of Botswana, Chobe National Park is the countries third largest game reserve, after the Central Kalahari and the Kgalagadi Transfrontier Park. Its near proximity to the borders of its neighbouring countries, Nambia, Zimbabwe and Zambia makes it an easy to reach destination from other countries and surrounding tourist areas. Chobe National Park covers an area of around 11.000 km2, spanning four different geological areas, consisting of floodplains, dense woodland, sandy terrain, grassland and savanna. The park officially became a national park in 1967 and took its name from the Chobe river that runs through it. The Chobe river runs along the northern border of the park attracting lots of wildlife during the dry season. The northern part is also located in close proximity to some other tourist destinations like Livingstone in Zambia, the Caprivi Strip in Namibia and Victoria Falls in Zimbabwe. Day trips between the different countries are offered making visiting various highlights in Southern Africa possible in a short period of time. Visiting Chobe National Park is one of the highlights of any visit to Botswana. 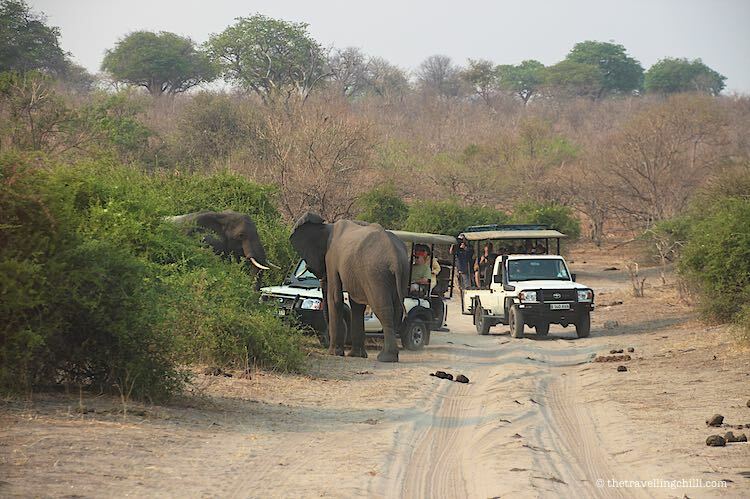 The park is very accessible, compared to some other great parks in Botswana, like for instance the Central Kalahari game reserve, where a suitable 4×4 vehicle as well as thorough planning and supplies are a necessity. 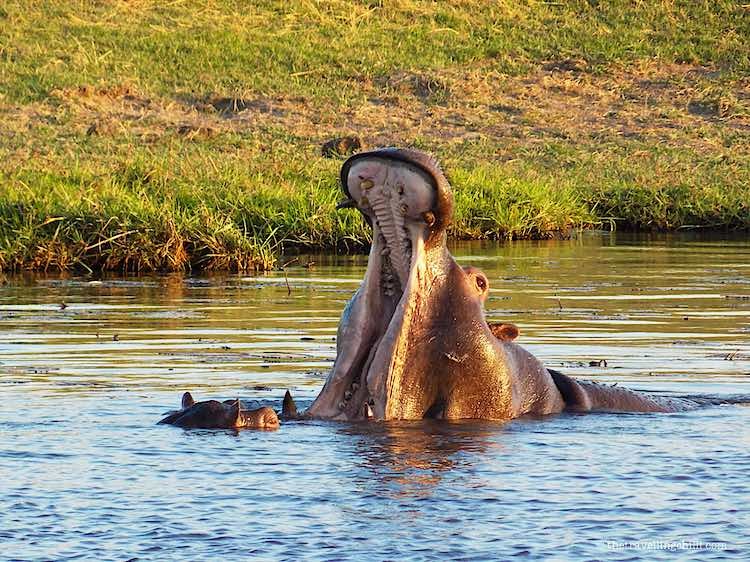 A safari in Chobe is also very different to a safari in the Okavango Delta in many ways, which makes them both great parks to visit on a trip to Botswana for the sake of a wide variety of experiences. Having worked as a tour guide has allowed me to visit Chobe National Park countless times over the last years. However, my first visit to Chobe was probably my most memorable. It was awe-inspiring to see those large herds of wildlife just everywhere along the river bank. It was in August, which means it was dry season, which is also when most animals gather along the Chobe river to find water and the fresh vegetation that still grows on the riverbanks. I remember large breeding herds of elephants with their baby’s standing on the floodplains and even crossing the river to the various little islands in the middle of the river. Elephants would cross in a single file in between the various tourist boats eager to eat the greener grass at the other side. Baby elephants would be assisted by a large family member, often just with their trunk sticking out of the water to breathe. What a spectacle to be able to witness such natural behaviour. Chobe National Park is home to the largest concentration of the African elephant, with estimations ranging from 50.000 to even 120.000 elephants present in the park. All in all, there are many elephants and visiting Chobe will give you a very high chance of seeing these majestic giants of the African bush. Chobe National Park does not have any fences and the elephants do cross borders to Zimbabwe towards Hwange National Park. Of course, no passports or visa needed, for the animals. Sorry humans. When visiting Chobe National Park, one thing is for sure, you will have the opportunity to see plenty of wildlife. This beautiful wilderness is home to some of the largest concentrations of wildlife. However, keep in mind that game density varies widely during the seasons. As mentioned before, during the dry season is when most wildlife will congregate close to the riverside and when most animals can be viewed. 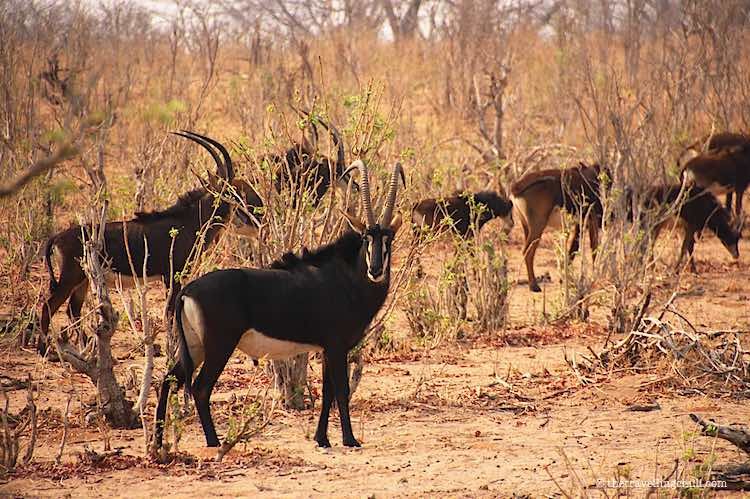 Sighting of some of the rare antelope species like the sable and roan antelope as well as the puku are not uncommon, apart from the more common antelopes like waterbuck, tsessebe, red lechwe and impala. 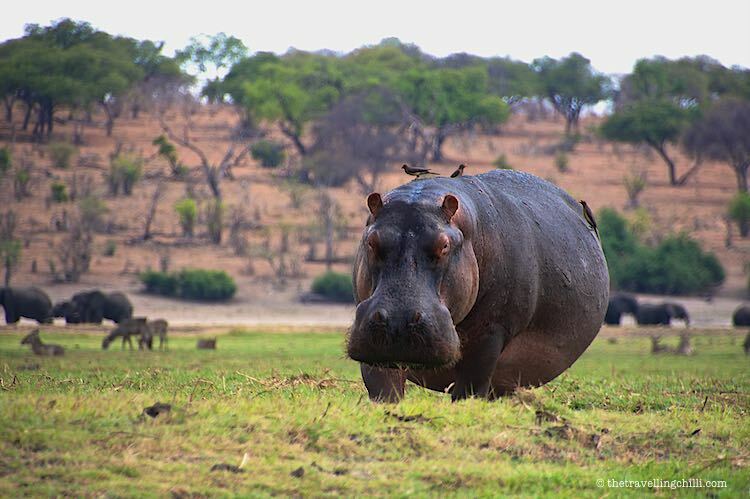 Vast herds of buffalo roams the floodplains in between the elephants, as well as lots of hippo. Crocodile are also soaking up the sun on the riverbanks and baboons play while searching for food. There is also a pretty high density of predators like the spotted hyena, lion and leopard. 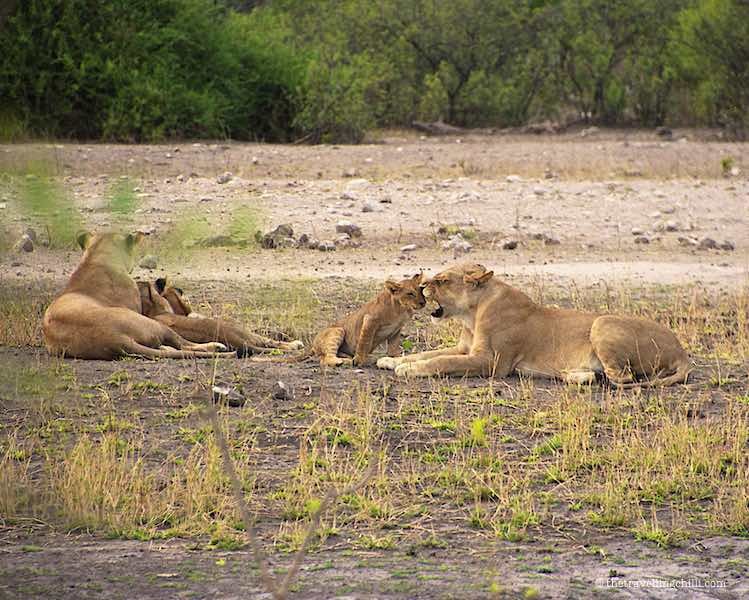 On the various safari trips I have done in Chobe, I have often, but not always seen prides of lions. One of the most spectacular viewing of a predator was the one time I saw a leopard kill. We were following a leopard who appeared to be stalking something, but it did not matter to him that a few safari vehicles were trailing behind. 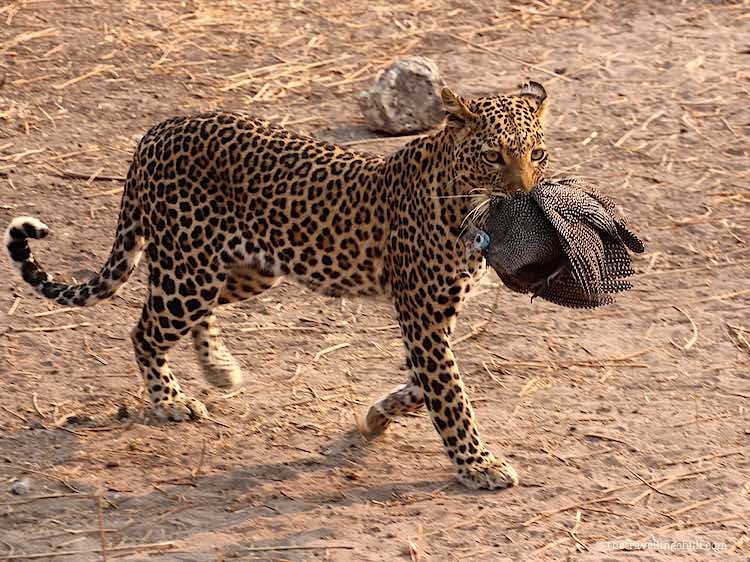 At a certain moment, the leopard jumped over a two metres high bush and caught a guinea fowl. It is not often that one gets to witness a leopard kill during day time. 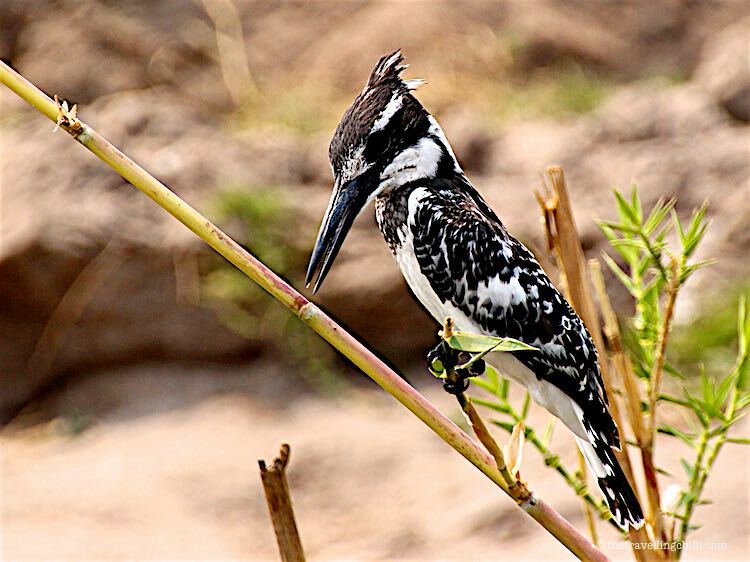 A large diversity of birdlife can also be seen along the riverfront, including the African fish eagle, various species of herons, storks and vultures, pied kingfisher, the colourful carmine bee eater and the impressive marabou stork. 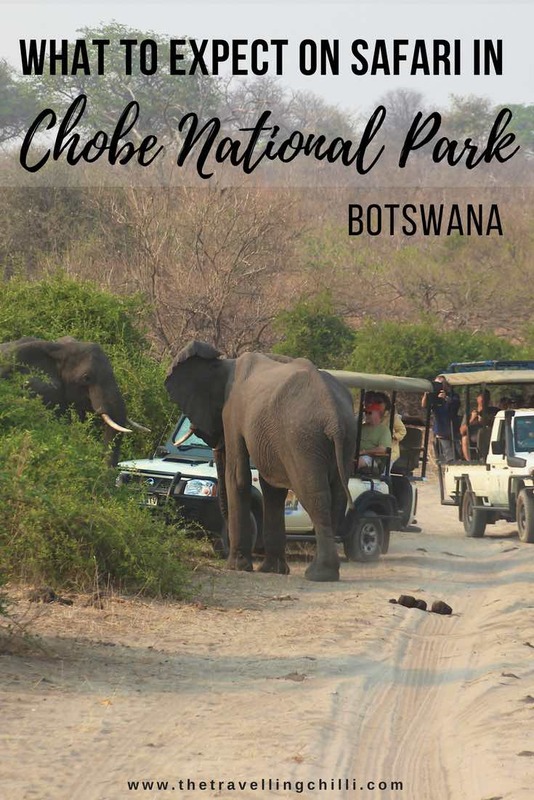 Most tourists to the Chobe National Park will either visit the park by driving through it between Kasane and Maun, which is the gateway of a visit of the Okavango Delta, or as an excursion from Kasane. The latter town is located at the north eastern corner of Botswana on the banks of the Chobe River. It’s the gateway for most tourists visiting Chobe National Park. If you are not driving through the park and want to just take a day tour from Kasane, there are three possibilities to visit the national park. Either as a self drive with your own or rented vehicle, with a guided tour or on a boat cruise. You can drive around in the park by yourself, however it is advisable to rent a 4×4 vehicle to tackle the many sandy roads. I once saw an elderly couple that got their sedan completely stuck in the sand a small distance past the entrance gate. There was no way they would manage to continue further and had to be towed back to the gate. So be prepared and get yourself a 4×4, and preferably get some 4×4 driving lessons on how to drive in deep sand so you can enjoy the drive through the park. Getting stuck is not a whole lot of fun. More and updated information can be found on this link to the website of the national park. Most accommodations and tour operators offer guided safari tours through the park. 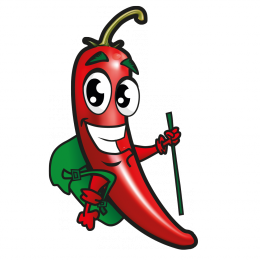 Most of these guided tours accommodate the needs of every visitor and budget. You can take a tour of three hours, either during the morning, midday or evening. In most other parks the general rule is that you will see most animals during the early or late hours of the day as the rest of the time they are hiding in the shade to avoid the heat of the midday sun. 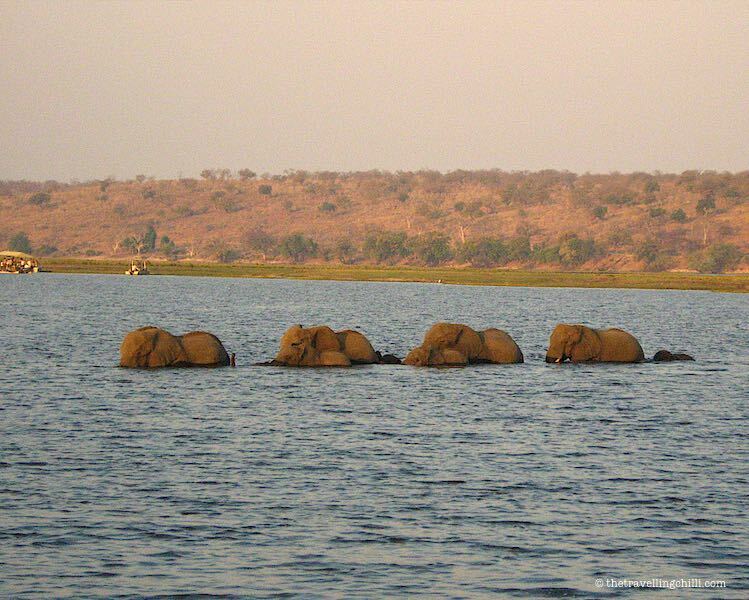 In Chobe, most animals will be in close proximity to the river and active throughout the day. 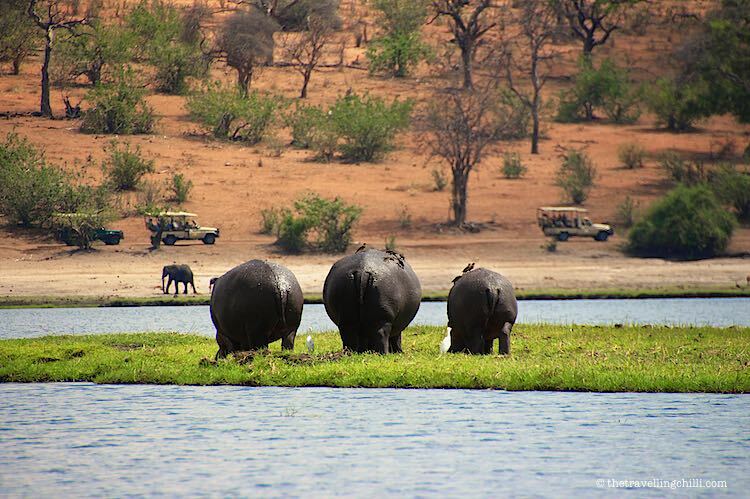 However, you should also note that Chobe is not a zoo and wildlife can sometimes be hard to find. There are no guarantees. It is also possible to do an overnight trip, where you leave in the afternoon for a sunset drive, stay overnight in the park and do another early morning drive on your way out. It will all depend how much time you would like to spend in the area. The overnight camping trip is really worthwhile and fun if you like the adventure of sleeping in a tent in an unfenced camp in the park. 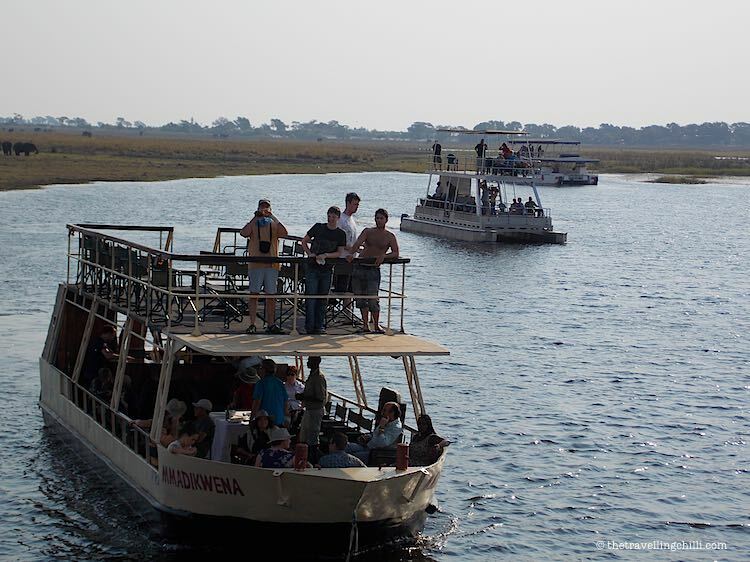 One of the best ways to visit Chobe National Park is on a boat cruise. These can be small boats accommodating around 10 people or slightly larger boats mainly for tour groups. Both ways are great. In the small boat you can get closer to the animals, on the larger boats you have a better and higher up view. I have done both and I personally liked the larger boats better. As said, you have a better view of the park and the animals, since you can walk around on the platform of the larger boat giving you different angles during your cruise. 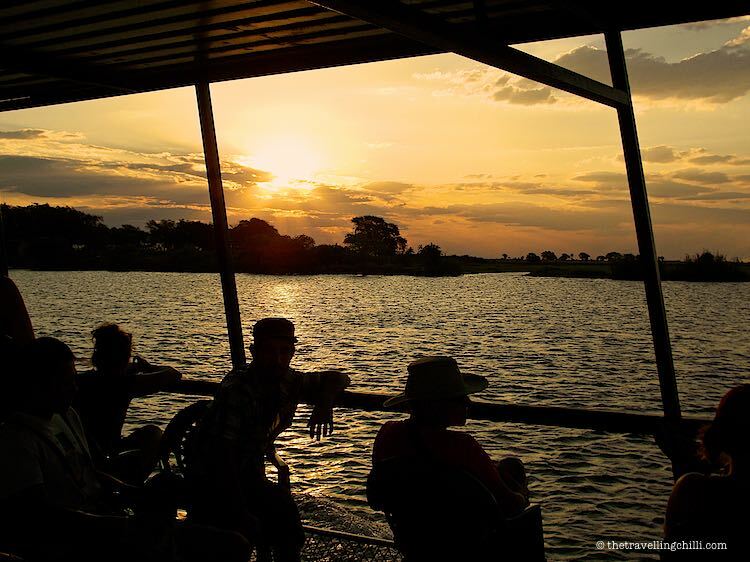 A sunset boat cruise is the best time, since you will be treated to some of the best African sunsets you will ever see. Any time of year is good to visit the national park. However, the most wildlife will be seen along the riverbanks during the dry winter months from May/June up to November/December. During the rainy season plenty of water can be found all over the park and the animals migrate to other places in the park and even to neighbouring countries to find food. You will still see wildlife along the river, but less chance of seeing the large herds of elephants and buffalo. 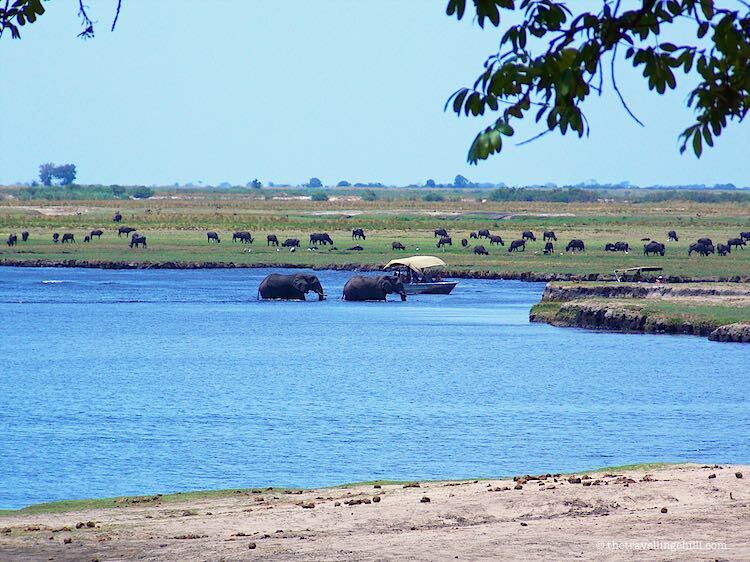 The bustling town of Kasane is located at the north-eastern border of Chobe National Park, and is the closest town to the border of Zambia, Zimbabwe and the Caprivi strip in Namibia. 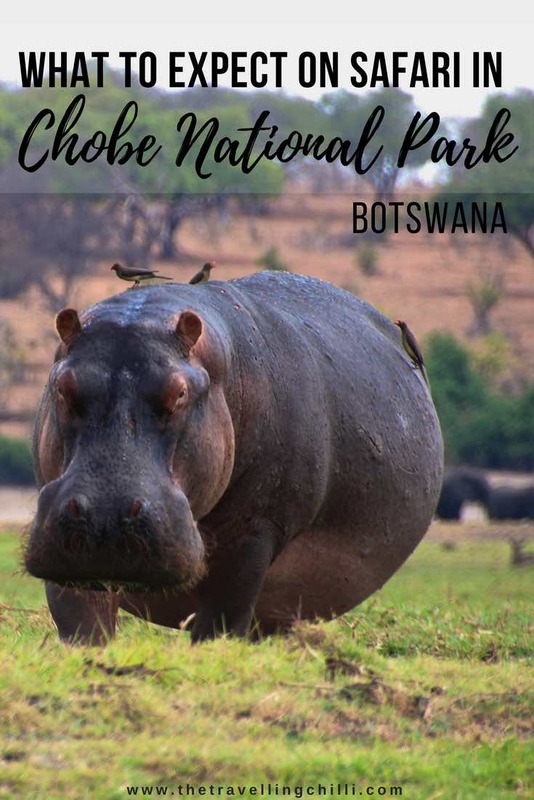 It is the gateway to visit the park by the Chobe river, which is the most popular area of the park to visit, since most animals congregate on the floodplain of the Chobe river during the dry season. The town has numerous hotels, lodges and campsites, as well as some shops, supermarkets, banks and money changing facilities. Kasane can get pretty busy with tourists visiting Chobe or visitors who are on their way to the various borders of neighbouring countries. It is also the main driving route for trucks on their way north or south of the continent. 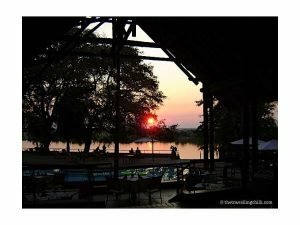 Thebe River Lodge: Of all the times I have been to Chobe, I stayed mostly at Thebe River lodge, which is the preferred accommodation for most overland tours. They have a fairly large campsite, nice en-suite accommodation and all activities can be booked there. 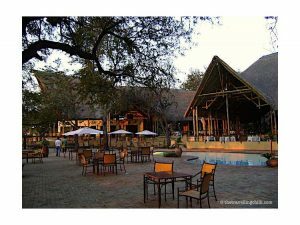 They have a small swimming pool, a nice bar area and sometimes you can see elephants by the fence right by the pool. 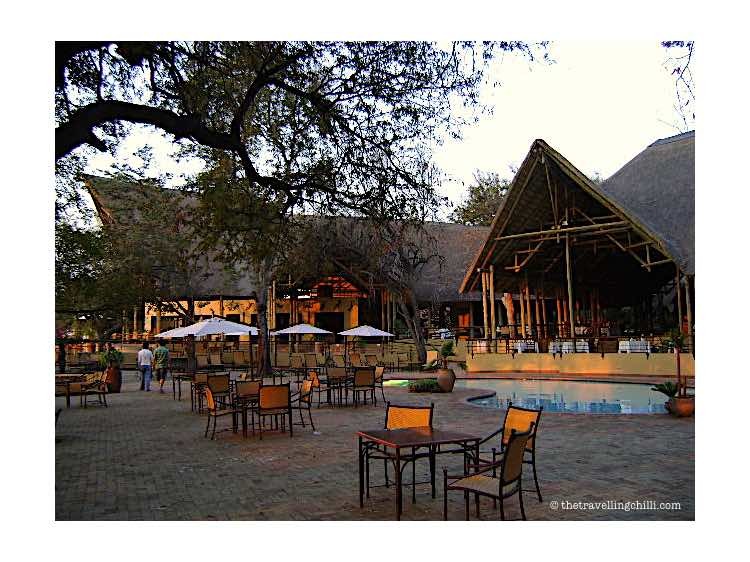 Chobe Safari Lodge: This lodge is overlooking the Chobe river and is located close to town. It’s a beautiful place with a nice green garden and a large thatched terrace where the restaurant and bar is located. They can serve you drinks while you lounge around the swimming pool area. Chobe Game Lodge: Indulge yourself at this 5 stay luxury lodge set on the banks of the Chobe River inside the Chobe National Park. This lodge was the all time favourite of Elizabeth Taylor and Richard Burton when on safari in Botswana. Other accommodation: Chobe National Park is very popular and especially during peak season most accommodations will be booked out. So it is advised to make a reservation beforehand to avoid having to run around to find availability, even for camping. If sleeping in Chobe National Park is not an option, the best place to stay is in Kasane. Disclosure: Some of the above links are affiliate links as we are participants in the Amazon affiliate programme. As an Amazon Associate we earn from qualifying purchases at no extra cost to you. Read more here. I love visiting National Parks and have just added Chobe National Park to my bucket list. My family prefers to see animals in the wild and it would be amazing to see the amount of animals that you took photos of. It is so cool that you got to see the leopard pounce on a guinea fowl! 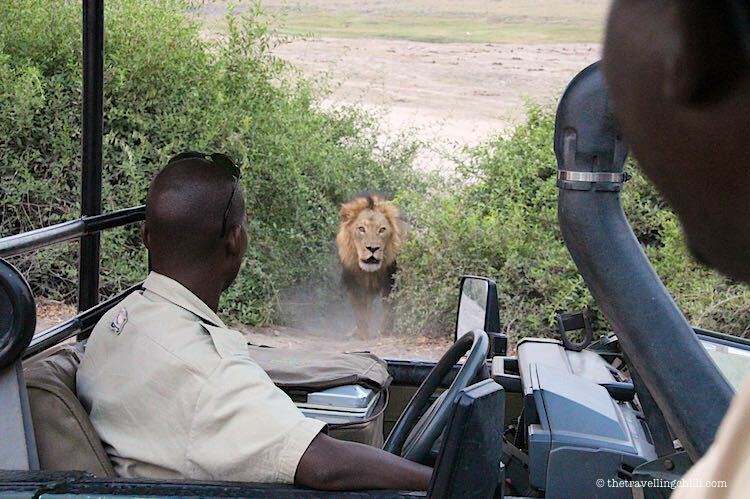 That lion is so close it is crazy, but it would be awesome to see in person. 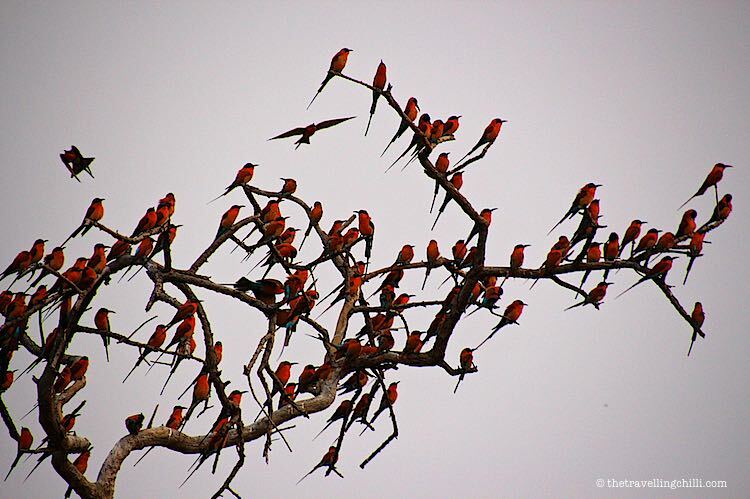 Interesting post with so many detailed information about Chobe National Park! I didn’t know the largest concentration of the African elephant is at Chobe National Park. Good to know about the boat cruise too. I always thought a safari drive is the only option. A boat cruise is definitely another cool way to see the park! Thanks a lot. Chobe National Park is indeed one of the safari parks where it is really nice to go on a safari by boat. I’ve only seen these giant African animals in zoos across the globe, but never in their natural habitat. I bet it’s a very different experience. Africa is not short of gorgeous parks like Chobe, in Botswana, so I can only hope to see one of these national parks someday. There is pretty much nothing that has moved me as much as going on safari and seeing these magnificent creatures in their natural habitat. We spent a few days in Botswana and got to hang out with the elephants of the Living with Elephants Foundation. It was one of the most joyous experiences of my life. It really is so nice to see the Elephants in Botswana. I have not yet visited the Living with Elephants foundation. Something to look at for our next Botswana trip. Chobe National Park looks like a veritable Eden of sorts. The pictures are stunning and bring alive the teeming wildlife that inhabit the park. Loved the pictures of the Lion and the elephants crossing the river, they are simply stunning. I have always been dreaming of seeing the national parks in SA. 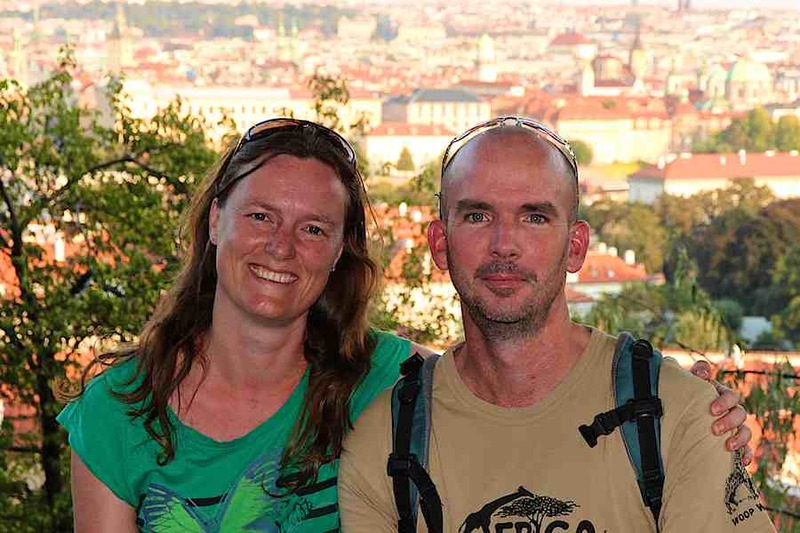 My partner went on a month adventure in SA last year including safaris and national parks. It’s so much fun to read your post getting a close encounter with the wilds. They’re beautiful creatures, and lucky you got to witness a leopard kill a guinea fowl. How does it feel seeing them all? Isn’t it somehow making you feel nervous but excited at the same time? And lodges here are great too, too many selections to choose from! When seeing one of the big animals or predators I must say, you feel the adrenaline rushing through your body. It is so amazing. And even after having done so many safaris I still get excited to see any animal in their natural habitat. The chobe national park is really huge. I like all the details you have put in the post. It is a well written post with great pictures. The idea of seeing park via boat is something which we would love trying. Thanks for sharing. 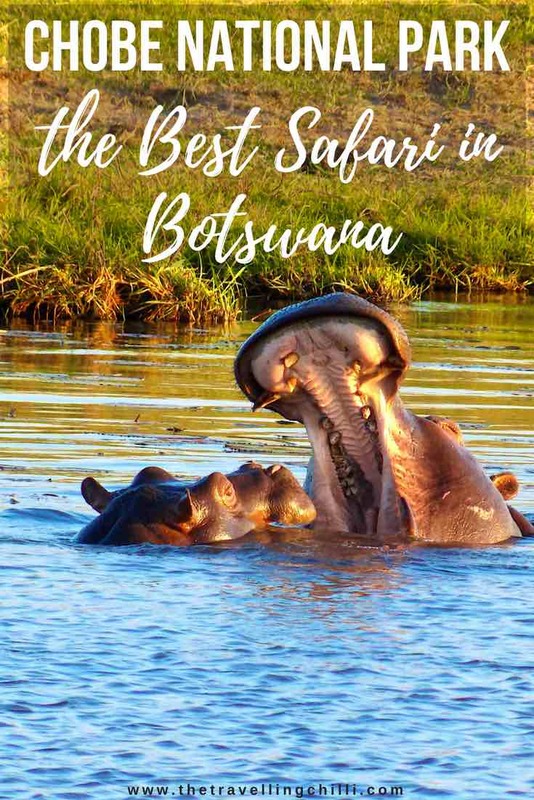 You should really do Megan, Botswana is indeed a country that promotes ecotourism as well as lower amounts of tourists but giving greater value of money. You’ll definitely love to visit Chobe National Park. It is a whole different safari experience. That lion’s face is absolutely gorgeous – wow! This whole experience is such a dream for me. It must have been such an amazing adventure! Your photography is absolutely stunning! I love the photo of the elephants crossing the river. I love how one of the calves is the caboose in the group crossing. I am imagining the youngester holding on to its moms tail as it crosses the river. That leopard shot is epic, btw. Wij gaan in oktober die kant op. Maar ik zie dat alle accommodaties die jij noemt al vol geboekt zijn. Moet je dan dus echt van te voren alles boeken of is er altijd wel wat vrij? hoe heb jij dat gedaan? In Chobe werd dat telkens gedaan door de reisorganisatie voor wie wij werkten. Deze campings worden al heel lang van tevoren geboekt door verschillende reisorganisaties. Maar in Chobe zijn er redelijk wat overnachtingsplaatsen, het zijn de meest populaire en grotere die sneller volgeboekt zijn. This is so cool! We just returned from a safari in Kenya and I loved comparing our trip with your photos. You guys did see a lot of animals up close and personal. Look at that cheetah, lion, and the elephant. Great post!